TEMPE — Two years ago, the management at Shalimar Country Club in Tempe tried something new. In an effort to increase its customer base and reach new people, the club held a footgolf tournament, after developing a course for the soccer-golf hybrid alongside its regular nine holes. Rather than hitting a golf ball, footgolfers kick a soccer ball toward a 22-inch hole, navigating fairways and rough, just like in regular golf. The scoring is the same, so birdies are still birdies and bogeys are, unfortunately, still bogeys. To the surprise of many Shalimar employees, more than 100 people — many in bright knickers and knee-high socks in homage to the late golfer Payne Stewart — filled the course. Now heading into its third summer, footgolf is thriving at Shalimar and providing the club with a new stream of revenue — something courses of all sizes across the Valley and the nation are looking for as the game recovers from years of losing regular golfers while failing to attract new players. For several years now, golf has struggled to regain its peak level of participation. For the fourth year in a row, 2014 saw participation stay around 25 million golfers, down from its peak of 30 million several years ago, according to the National Golf Foundation. But as Shalimar found, something like footgolf is an inexpensive way to bring in paying customers and introduce people to traditional golf through a fresh alternative. While it might not be as successful for larger, higher-end courses, it’s a good fit for smaller venues that serve as an affordable alternative for many golfers, according to Paul Szymanski, the director of golf at Shalimar. That sport is finding a niche. 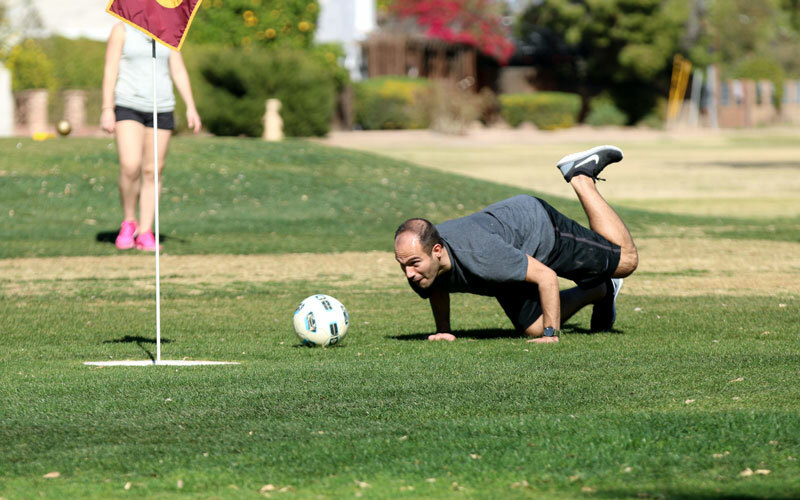 There are currently five courses in Arizona that offer footgolf, according to the American FootGolf League website. At Shalimar, footgolfers share several fairways with golfers, are mixed into afternoon tee times and pay the same greens fees. It took awhile for regular golfers to get used to the new game, but now, according to both Szymanski and Lentino, most see how seamlessly they go together and the new life it’s brought to the course, with tournaments and leagues bringing numerous players and fans. Phoenix resident Robert Morales played in a group of seven with his wife and friends for the first time in February. Morales thought the game was a great way to combined his past experience playing golf with his group of friends, who all had soccer experience. While the game certainly had its challenges, Morales said the group had enough fun that they are considering playing other footgolf courses across the Valley. Footgolf not only brings new people to the course, but it’s also getting some interested in playing the traditional game. Where footgolf has succeeded in updating the game to attract young people and generate revenue, Topgolf has done the same for getting clubs into the hands of more people, even those who have never golfed in their lives. At Topgolf’s Scottsdale and Gilbert locations, players take aim at a variety of bright targets spread across what looks like a traditional driving range. Groups and individuals play a number of different games while tracking their score and shot statistics on a panel at their tee box. Golf experience isn’t required to have fun. The relaxed atmosphere that integrates a bar and restaurant is a perfect way to introduce people to the game and keep them coming back. Eventually, it might lead them to a real round of golf, according to Jesse Hughes, a PGA-certified instructor and the director of instruction at Topgolf in Scottsdale. Topgolf instructors use technology to give positive feedback immediately to students, keeping them motivated. Not only is Topgolf bringing in a number of players at different skill levels, it’s getting young people interested in the game as well, according to Hughes. He says Topgolf has 25 kids per week during the summer for a nine-week golf academy. And there is an after-school program during the rest of the year. Not everyone is as convinced about what these updates might be doing to help grow the game. Bob McNichols, owner and operator of Longbow Golf Club in Mesa, believes Topgolf is more of an entertainment venue, like a movie theater. To him, the lights, targets, automatic scoring and large restaurant certainly bring in people who like to use electronic devices, but it’s not like the actual game of golf at all. “Now, a lot of people think that’s good that there is a way to get people interested in golf by going to a place that has games as the metaphor for the golf industry itself,” he said. “But unless they take that experience and come out to the golf course and like what they find on the golf course, they’re not going to be happy with it. Most in the golf industry agree that the game needs to find new ways to reach younger generations of golfers. However, they don’t always agree on how to go about it. Some, like Tom Loegering, who is the CEO at Sun City Country Club, believes that golf has characteristics that have drawn people to it for hundreds of years. He would rather promote those aspects of golf. Loegering doesn’t dislike updates like footgolf or Topgolf, but he believes the game’s values are important when bringing young people to the game. Loegering founded the Golf Program in Schools (GPS) that started introducing students in the Peoria Unified School District to the game last April. Loegering’s goal with GPS is to reach high school students and educate them about the lifelong benefits of playing golf, values it teaches and opportunities it can open up in business. Those benefits can include a college education for students good enough to earn a scholarship. GPS students first learn the basics from PGA-certified instructors at their school before taking a field trip to Sun City Country Club to walk the course, hit the driving range and practice their short game. Instead of relying on things like technology, GPS highlights what people of all ages can learn from the game and use in their life. Throughout the process, Loegering emphasizes respect, the personal relationships golf builds and the persistence required to improve. More than 800 students have heard the message so far, and GPS is expected to reach 3,200 students in seven high schools this year, primarily teaching freshmen in required physical education classes. While there are programs like The First Tee that introduce the game to young kids, Loegering hopes his program can catch anyone those programs might miss. Even in its brief time, GPS has found success with the teachers involved and the kids who play. Some have joined their high school golf team after being introduced to the game by the GPS program. With participation numbers for the game down, the introduction is building a foundation for the future that would have otherwise been lost. “When I first heard we were going to have to golf, I thought, ‘This is going to be boring, it’s only for old people, kids don’t do that stuff,’ ” said Zhela Sabier, a freshman at Peoria High School who had never golfed before her time with GPS.